Sergio Aguero finally got back to form on Saturday with his record-breaking five-goal haul, but it was a mixed afternoon for two of Manchester City's big-money summer arrivals. Kevin De Bruyne and Raheem Sterling were brought in at great expense to lighten the load on the Argentina striker, who has been heavily relied upon to find the net and in fact scored 31 per cent of his team’s goals in the league last season. But while De Bruyne helped himself to a goal and two assists after the break against Newcastle, Sterling was withdrawn at half-time following a disappointing first half. The two could cost the club over £100 million between them, but since De Bruyne came into the team he has fared far better than the former Liverpool man. Sterling was hailed for helping to bring a greater balance to the City side in his first few games, with essentially all of his team-mates playing brilliantly, and especially left-back Aleksandar Kolarov. 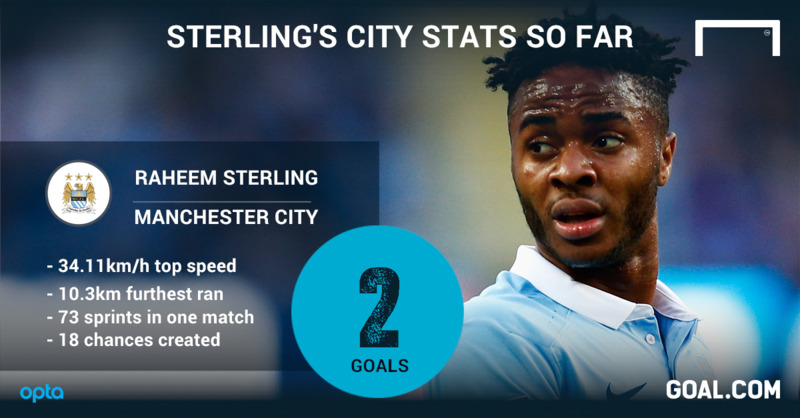 But as City's form took a slide, starting with defeat to Juventus, Sterling grew increasingly ineffective. He missed two great chances against Juve, was subbed off against West Ham and had a shocker at White Hart Lane. In 45 minutes against Newcastle on Saturday he struggled to beat Daryl Janmaat and was taken off for Jesus Navas. Kolarov’s form has withered, too. De Bruyne, meanwhile, has been largely brilliant since coming off the bench to make his debut at Crystal Palace. The four goals he has scored in his seven outings have only been tempered by one poor pass against Spurs, which led to their all-important equaliser. With both men away with their respective national teams, we take a look at how they have settled into life at their new club. Sterling’s best commodity is perhaps his pace, and he clocked his quickest top speed (34.11km/h) against Everton in what has probably been his finest game for City to date. De Bruyne, though, is not far behind and reached 33.22km/h in the Spurs victory, probably his worst game despite scoring! 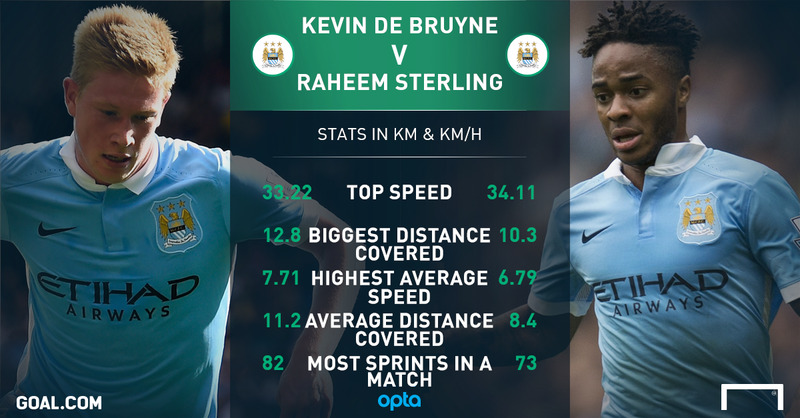 While Sterling’s top speed so far is quicker than De Bruyne, his highest average speed is 6.79km/h, 1.02km/h slower than De Bruyne. The Belgian, too, has consistently covered more ground, and in defeat against West Ham he ran 12.81km, a season high for him. In his three Premier League starts, he’s covered over 11km in each game, and each time that’s been more than any of his team-mates. Sterling broke the 10km barrier against Spurs for his season high, but his stats have been affected by recent substitutions - which tell a story of their own. 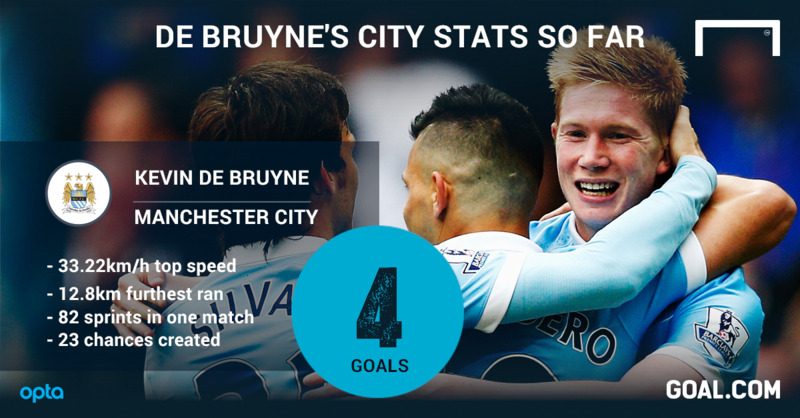 De Bruyne, too, tops the Englishman when it comes to the most sprints completed in a match. He managed 82 in that loss against West Ham - 11 more than serial sprinter Jesus Navas, who was second on the day with 71 - so it clearly wasn’t through a lack of trying on his part that City could not fight their way back into the game. Similarly, Sterling’s high of 73 – more than anybody else except Dele Alli and 22 more than De Bruyne - came in vein against Spurs. The most tangible stat of all is goals, and De Bruyne has four to Sterling’s two. The Englishman’s came just after half-time against Watford, when he was switched to a central position after struggling on the left, and against Sunderland in the League Cup. He has missed four clear-cut chances in all competitions, however. De Bruyne hasn’t missed any of his. He marked his first start with that goal from outside the box against West Ham, added to his tally in the League Cup three days later, scored again at Spurs four days after that and added a delicate volley against Newcastle. He has two assists, both against the Magpies, while Sterling has one, for Kolarov’s important opener against Everton. 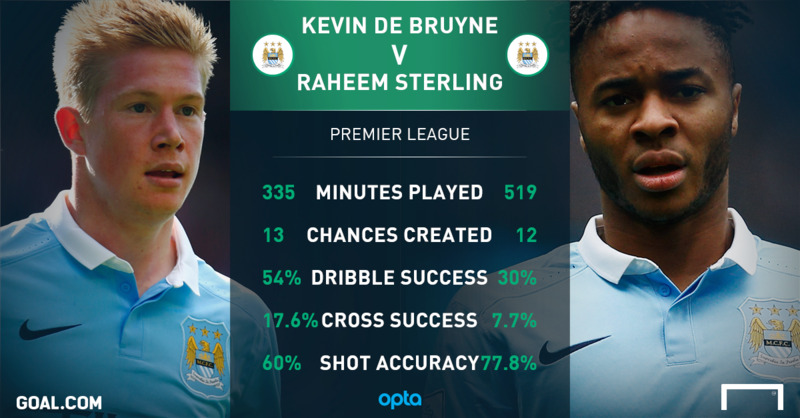 Sterling has created 18 chances in all competitions, while De Bruyne has laid on 23. In terms of dribbles, Sterling has completed 15 of 44 (34%) to De Bruyne’s eight of 13 (61%). Defensively, Sterling has made 12 tackles, twice as many as De Bruyne, although the latter boasts an 83% success rate compared to the former’s 75%. At the moment, Manuel Pellegrini hasn’t seemed to get both to shine on the pitch at the same time. If he does, Premier League defences will have an awful lot more to worry about. Thanks to Goal.com for their kind contribution.